Campeggio Le Moulin si trova a Chef-Boutonne, Deux-Sèvres, è situato fiume/torrente. Questo campeggio dispone di piazzole delimitate, sia ombreggiate che, senza ombra e piazzole poco ombreggiate. È possibile affittare casemobili. Ogni anno un ispettore visita il Campeggio Le Moulin, controllando oltre 200 tra attrezzature e altri punti di interesse del campeggio. L'ispettore è un dipendente ACSI e non lavora per il campeggio. Loud music put us off trying the pool. Near farmland and a stream, so plenty of flies to spoil eating outdoors. Local village has nothing to offer. Friendly owners nevertheless and cheap. We received a very friendly welcome on arrival and the staff were very helpful and friendly at all times. The pitches and shrubs were neat and tidy and were very well looked after. The sanitaires were always nice and clean and the swimming pool was warm, clean & a pleasure to use. The food in the restaurant was excellent and very good value for money. We will definitely be going back. While the GPS Co-ordinates in the 2015 ACSI Guide are incorrect the directions from the campsite owner when you call are also incorrect as you should be on the Brione road and not the Niort road as you come out of Chef Boutonne. While the owner prefers to only open up 1 combined shower/washbasin/wc in the Low Season, with 5 or more units on site the hot water does not last long and you can have one very long wait to spend a penny! I would not return to this one. The shower block was closed even tho' it was still September. There was only one toilet which included the shower so it was busy for long periods. The shower and toilet were very dirty. We spent a very enjoyable week camping here, great place to relax and unwind. All the pitches are level & flat with all of them close to the resurant/pool area. The resturant serves good quality food and my son loved the pool area. The staff were friendly and very helpful. The shower block seems to have been recently refurbished and is more than adequate. We had a great time here and will defiantly be returning. Excellent friendly family run site in a rural area with lots of interesting sites to visit within a 1 hour drive, on-site restaurant has a good value varied menu with some themed nights, popular with locals. Volete prenotare il campeggio Campeggio Le Moulin o oppure saperne di più? Potete farlo usando i seguenti dati oppure tramite il sito del campeggio. A Chef-Boutonne seguire D740 verso Brioux. Camping segnalato. 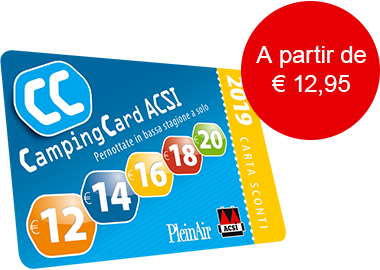 ACSI Eurocampings invia la tua richiesta di informazioni al "Campeggio Le Moulin".